THE DGE OF AP SSC PUBLIC EXAMINATIONS, MARCH 2017 has released ONLINE STUDENTS' REGISTRATION/APPLICATION FORM and USER MANUAL. They released the process of GENERATION OF NOMINAL ROLLS with USER MANUAL. So all the Headmasters have to furnish the Students' Data through online registration form compulsorily, failing which their school data cannot be included in the Nominal Rolls for the SSC Public Examinations, March 2017. Original Challan of Examination fee payment. Opening Permission / ETRs in respect of Private/Aided Schools. Age Condo nation Orders, if any. Scanned images of the pass port size photographs of the students in 'jpg' format of 10-30kb size. Scanned images of the signatures of the students in 'jpg' format of 10-15 kb size. Click on SSC-2017 Online Applications. 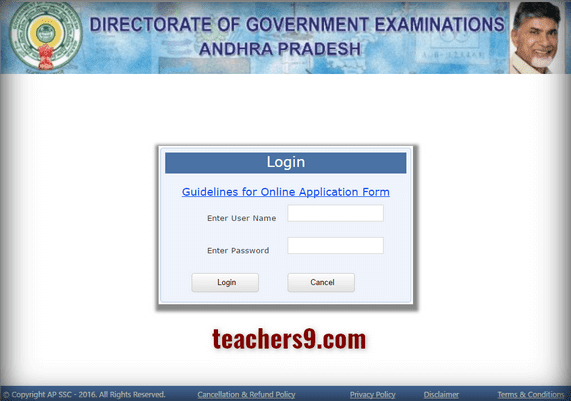 Download to fill AP SSC/ 10TH CLASS STUDENT ONLINE REGISTRATION FORM and USER MANUAL. when will 2017-18 site be opened?